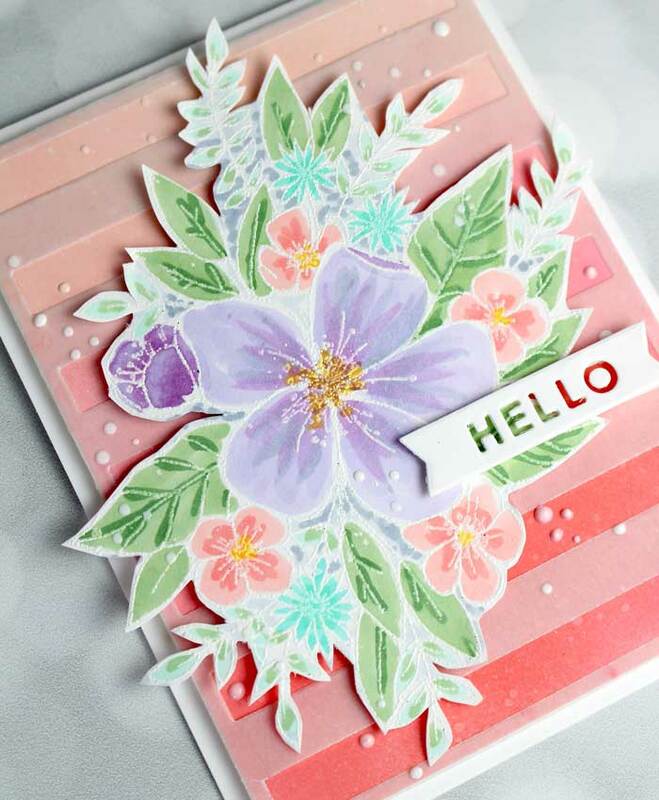 I have colored this beautiful burst of flowers a few ways (you will see others in upcoming posts) but this one is first stamped and heat embossed with white embossing powder onto 110lb. Neenah white card stock. Then I set to work with coloring it. Each time I have colored it, I try to use a slightly different color combination. With this design, I decided that I would use more lavenders and purples since that isn’t a color I use much. Here is a Copic Color Guide to show the colors I used. 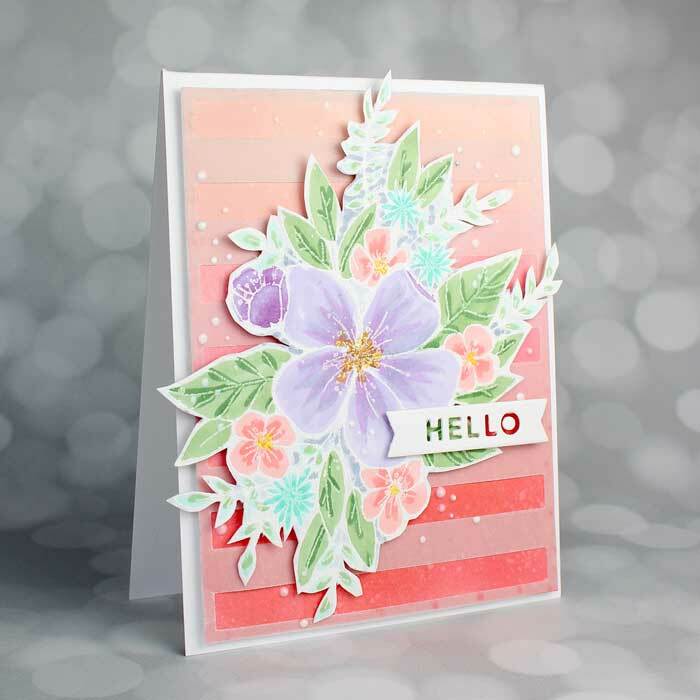 Once the coloring was done, I cut out the flower cluster with the matching die and then added a few snips around the small leaves to give a little more lacey look. With that done, I set it aside for now and worked on the background. The background was an easy ombre one. I just did a little color blending by adding Abandoned Coral distress oxide ink at the bottom of a white cardstock panel with my blending tool, then Worn Lipstick distress oxide in the center and finally Tattered Rose distress oxide ink at the top. I splattered droplets of water on it, blotted them dry and moved on to the next step. 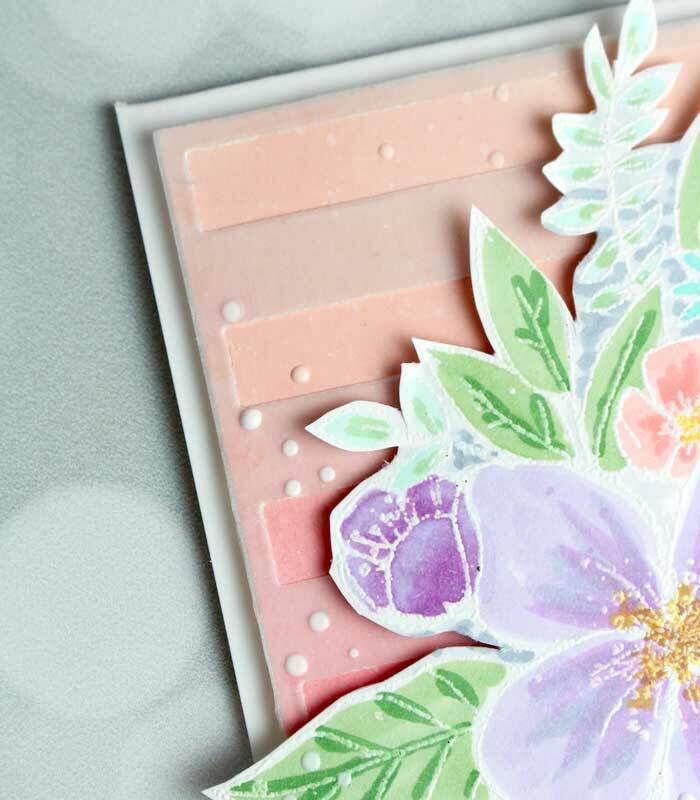 To add an extra dimension, I cut out a vellum cover-up using the My Favorite Things Bold Stripes Cover-up die and mounted it on top of the ombre background, then added a foam layer on the back. With that done, the ombre background combo was mounted onto a slightly larger white card stock card base and the flower cluster mounted on top with some foam tape.